Save time and stress in the morning by putting together overnight oats the night before! One of the best aspects of Koeze peanut butter is that it comes in a glass jar. When the jar runs low (a bit more frequently than I care to admit), it becomes the perfect home for overnight oats. Not only does it already have a resealable lid for overnight refrigeration but you can spare yourself the humility of trying to shove your entire face in the jar trying to lick it clean. Not that I would ever do that…. Overnight oats are a fun way to get the kids involved with breakfast. Let them get creative as they customize their own jar in the morning with various toppings such as apples, blueberries, shredded coconut, banana slices or chia seeds. Prefer a chewier texture? Use steel cut oats instead of old fashioned. 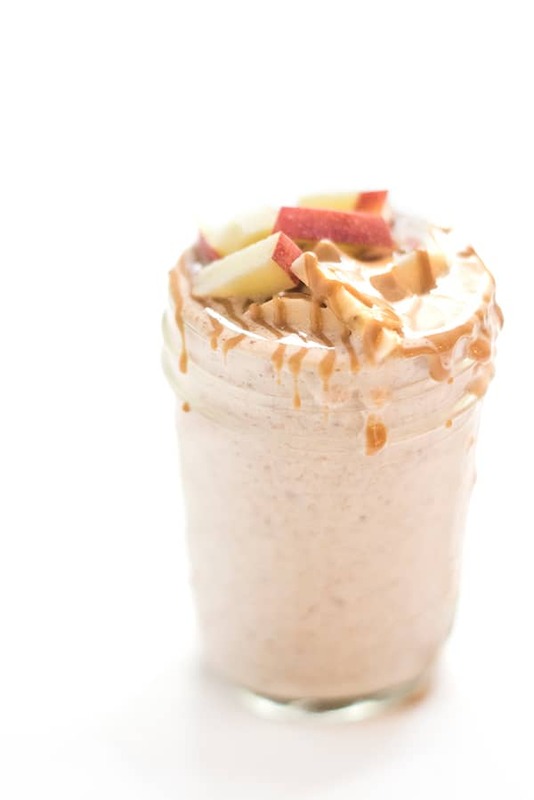 Add oats, almond milk, yogurt, chia seeds and peanut butter in a resealable glass jar and stir to combine. Top with banana and strawberry slices before serving in the morning. 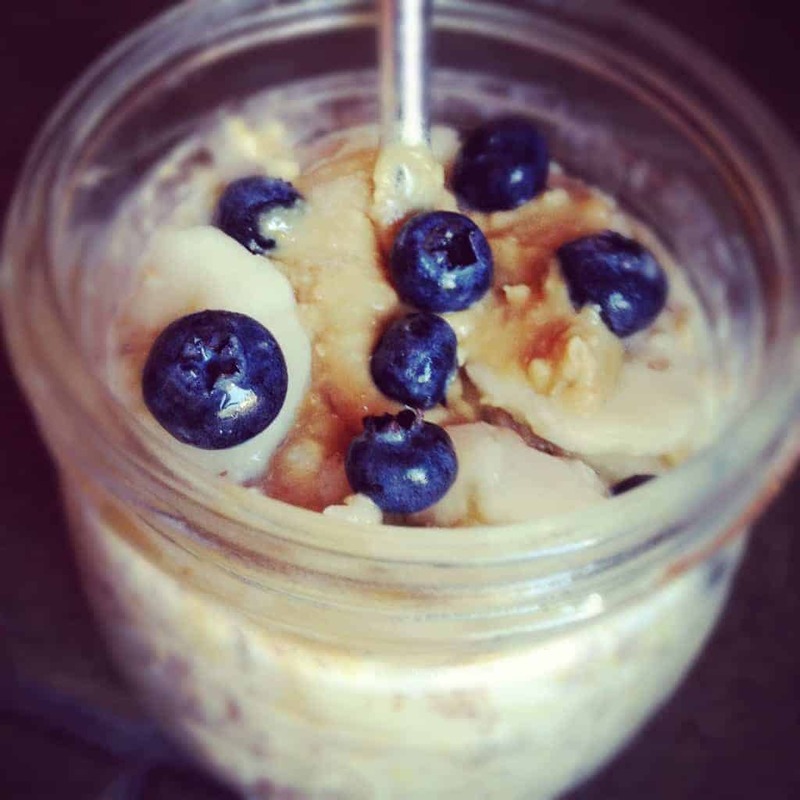 Overnight oats can be eaten cold, room temperature or warm. If you prefer it warm, simply microwave for 60 seconds in the morning. 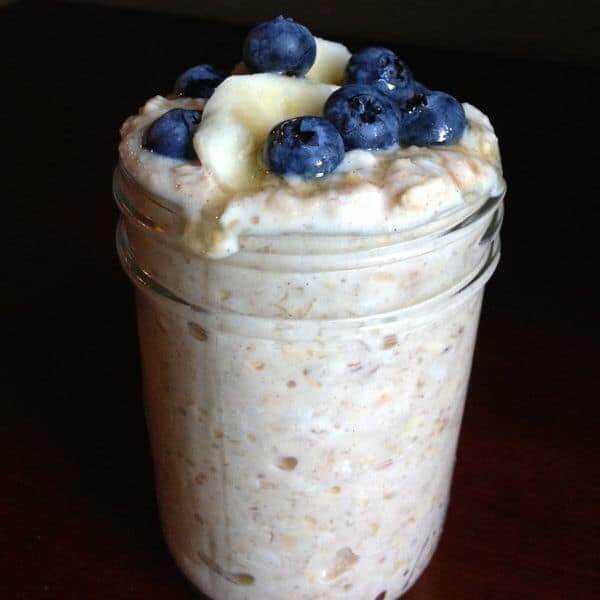 What size mason jars do you use for these overnight oats? You know what, I usually use a peanut butter jar but I would say a 16 ounce jar is perfect! Liz, I love Koeze’s peanut butter too!! Meijer’s had it on sale last week and I bought 1 smooth and 1 crunchy!! YUM!! Your recipe sounds heavenly!! I already put Koeze’s in my hot oatmeal and on a banana for part of lunch! I’m going to try it as soon as this cold, rainy weather we’re having here in GR/Grandville gets outa here and finally warms up!! I hope you love it!! Just had Koeze today!! Subtract the chia seeds and replace them with chocolate chips and I think I’d love this. :) Peanut butter, banana, and chocolate. It’s like heaven in a bowl! Oh man that sounds good to me too!! My favorite flavors! Love Koeze Nut! I go through lots of it! Oh man so do I!!! It’s embarrassing! Could you sub buttermilk for the almond milk? It reminds me of the start of my favorite muffin batter. If you like the taste of buttermilk – then yes!!! Perfect for glass jars laying around!! Great with lots of various mix-ins!! Such an easy (and earth friendly) idea! I just recently discovered the joys of overnight oats. This one looks really good, I’ll have to try it! 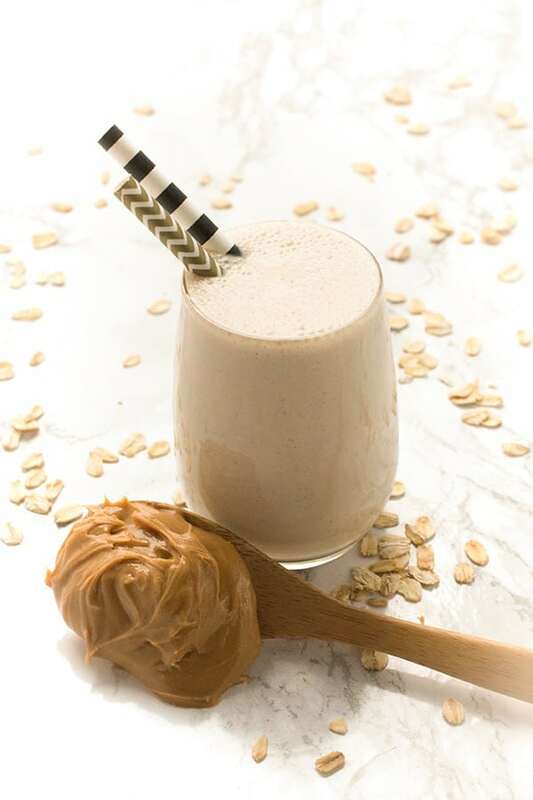 I always love seeing the overnight oat ideas! They are so inspiring and look really satisfying! Mmmmm… Peanut butter and banana. Those are my favorite flavors. You may have just convinced me to give this whole overnight oats a go! These sound perfect. 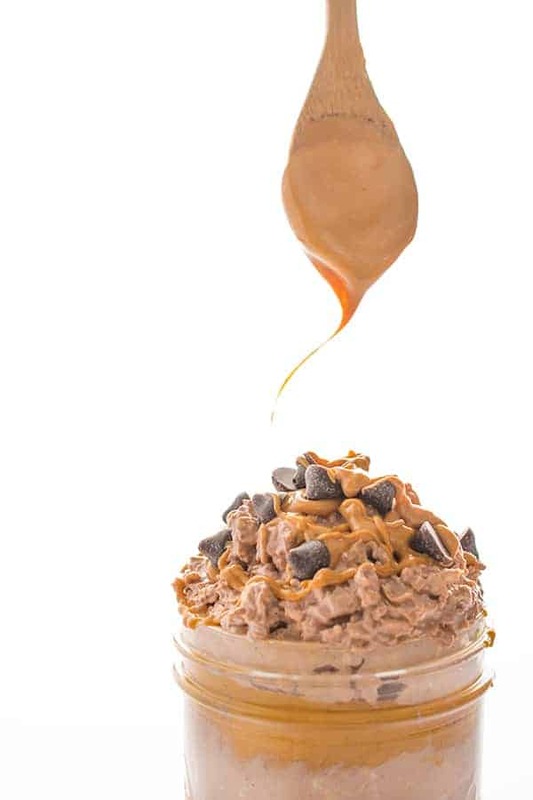 I love overnight oats and this is one of my favorite flavor combinations. I love overnight oats! Looking forward to those mornings where it’s too hot for hot cereal! Will they ever get here?! Oh Jamie I hope so!!! I make these all of the time! One of my favorite on the go breakfast’s! Great recipe and i love the strawberries and banana in it! I need to make it more often!!! Whenever I do I kick myself for not doing it more. This looks yummy and so perfect for my rushed mornings! Just a question, is it normal oats you use or is it a special type of oats? Normal, old fashioned oats. :) You could use any kind though – quick cooking or even steel cut! How have I never made overnight oats before? Im missing out..this is happening asap! You need to get on that. ASAP! You MUST get Koeze!! They sell it at Zingermans! This looks so interesting and delicious! I can’t wait to try this! It’s so nice, especially for busy mornings, to wake up and have breakfast ready! Love this!! A great breakfast idea. Love, love, love it! I make something similar in the morning, but now that fruits are making their seasonal comeback, I need to add strawberries!! I know – I’ve been adding strawberries to EVERYTHING!!! Never tried this before… Need to give it a try!!! I just started eating it a few years ago but I love it and am hooked!! Thank you Anne!! Let me know what you think!! I’ve been getting into overnight oats and this one sounds good. I haven’t tried heating them up yet – might need to do that. Sometimes when it’s cold out I’ll heat them up a bit – it’s nice to have the options. :) Enjoy! Mmmm, love me some PB and banana! This sounds like the perfect way to begin the day! Love how convient this is! YUM! Love that you add chia seeds! This is a perfect breakfast! I’ve been doing a ton of baking with pb and banana lately, it’s probably about time I made something a little more healthy with the two :) Your oats sound great! These sound fabulous! Can’t wait until the snow stops flying and I can make these for breakfast! Yum! I love this idea. I’m always in a rush come morning, so a make ahead meal sounds perfect. And there’s peanut butter involved, so major bonus points there!